Electronic musician Thom Brennan, while reaching inward, seeks to create music with an emphasis on his relationship with the forces of the natural world. 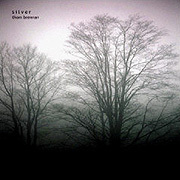 His album Silver (76'49"), with its eight works, moves between the dreamlike stillness of contemplative space, to the seductive powers of shimmering synthscapes, to the fierce brilliance of churning harmonic motion. On Silver Brennan probes deeper into familiar themes. His musical ideas are reiterative but not repetitive and run through this album like a strong current. Waves of sound roll towards the listener in seemingly infinite variations, each somewhat different from the next. The beauty of this album can be found in these minute departures. Brennan's music is geographical. It occupies a physical and philosophical location... and brings the material world to life so palpably.